On March 23, 2013, Angelenos were shocked and then amused by a surprising bit of skywriting authored by pilot and comedian Kurt Braunohler. Skywriting has been used since either 1915 or 1919, as its origins are disputed. Used for advertising or personal messages, Kurt Braunohler found a new use for the venerable media. Born in 1976 in New Jersey, Braunohler became a comedian first performing in street shows (Kurtbot) and moving on to working with notable other comedians (many familiar faces from Comedy Central and The Daily Show) with the Neutrino Video Project and Hot Tub (hosted with Kristen Schaal). Expanding to HBO, stand up, and other projects, Braunohler created web casts and comedy albums, marking him as a major force in comedy. Braunohler hosts a podcast called The K Ohle on the Nerdist Network. Kurt’s Kickstarter skywriting project of 2013 fulfilled a stated desire to use skywriting as comedy. Comedy it was, when the people of LA were treated to enormous letters in the sky spelling out “HOW DO I LAND?” Undoubtedly some people thought the message was serious, which to me makes the gag all the more funny. What skywriting messages would you think are funny? Where should those messages be written? Please share your comedic inclinations with us and your fellow readers. 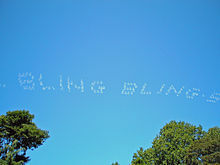 “Bling Bling”: Dot matrix skywriting over the hamlet of Bridgehampton, New York, August 2006. Braunohler, Kurt. How Do I Land? Kill Rock Stars, 2013. Previous Article“Life”: The Name of Terror is Calvin! Next Article March 24, 2017: Donald Trump, Phony, Phony, Phony Patriot! January 1, 2019: Fake News for the New Year!